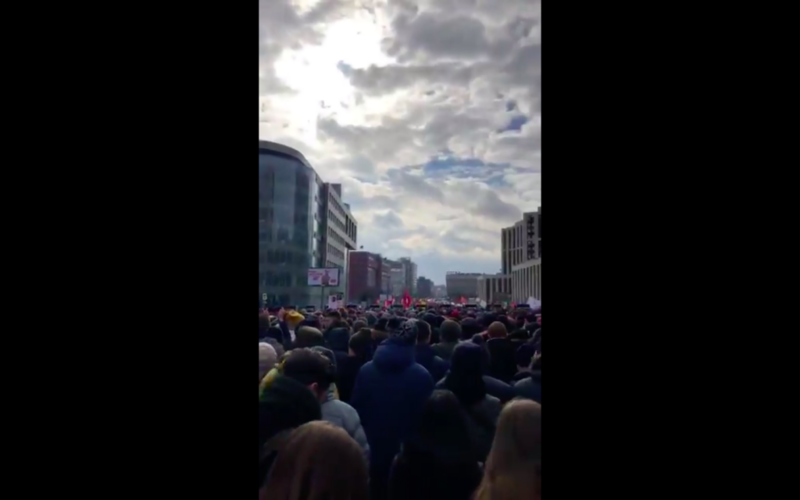 Approximately fifteen thousand people rallied in Moscow today in a protest against government attempts to censor the internet. There were smaller events around the country. The mass rally in Moscow and smaller events in other cities across the country was called after the Russian lower house of parliament backed a bill to stop Russian internet traffic from being routed on foreign servers, in a bid to boost cybersecurity. The move was labelled by critics as the latest attempt to control online content under President Vladimir Putin, with some fearing the country is on track to completely isolate its network like in North Korea, reported AFP. At least 16 people were arrested ahead of the protests, which were authorized by authorities. Eight of them were detained for using “floating devices” when they released blue balloons in a sign of protest, according to Russian news agency Interfax, citing protest organizers, reported DW. Russian authorities have attempted to shut down the popular encrypted communications app Telegram without success. However, government agencies are working on a new way to block the program. When combined with the encroaching lack of freedom of the press, the population fears going back to the repressive days of the Soviet Union.